Castable Polyurethane Elastomers is a practical guide to the production of castable polyurethane articles, from simple doorstops to complex items used in the military and nuclear industries. The book shows the progression from raw materials to prepolymer production, including the chemistry and functionality of the production processes. It provides a comprehensive look at various problem-solving and processing techniques, examining the selection of different types of systems on both the micro and macro levels. It also discusses curing and post-curing operations, conveying the importance of using the correct property for the application. 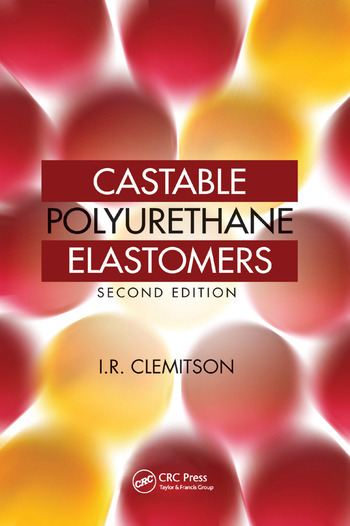 Castable Polyurethane Elastomers, Second Edition explains the production of polyurethane components, filling the gap between pure chemistry and trade information. I.R. Clemitson has worked in the chemical industry for 45 years. Predominantly, he worked in the polymer industry, both in production and development, concentrating on rubbers and polyurethanes. In 1999, he received a master’s degree from the University of Technology in Sydney, Australia. His thesis was titled "The Influence of Polyurethane Chemistry on Erosive Wear." During this time, he was working at the R and D laboratory of Warman International in Sydney, Australia doing research into polyurethanes and other elastomers. In the concluding years of his full-time work, he was employed in the development and manufacture of polyurethane elastomers and foams. He also gave lectures at the local training institute and to industry on aspects of polyurethane and rubber technology. He has authored two books on polyurethane elastomers, namely Castable Polyurethane Elastomers and Polyurethane Casting Primer. "Whether you are an experienced technologist or a beginner, this how-to book will serve as your bible. Castable polyurethane elastomers are an important and growing worldwide industry. The extent of the growth is due to constant improvements and innovations in both technology and manufacturing procedures. The reader will benefit from the logical sequence of polyurethane chemistry to the formulation of world-class castable elastomers." "Written in simple language for hands-on practice. Provides details of processes and also solutions to problems. Safety and health is emphasized throughout the whole book." "Whether you are an experienced technologist or a beginner, this how-to book will serve as your bible. ... The reader will benefit from the logical sequence of polyurethane chemistry to the formulation of world-class castable elastomers."